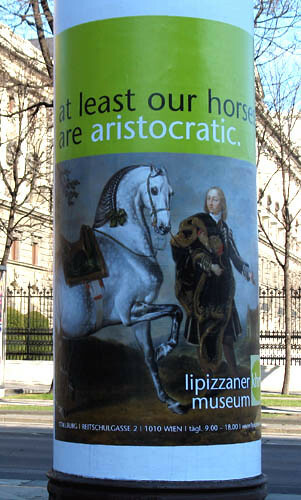 This should please at least some in the on-going “Where are they REALLY from” debate: The AP reports that the 430-year-old school which features Slovenia’s renowned Lipizzaners, is on the verge of bankruptcy after showing a loss of EUR 1.9 million last year. A US tour was canceled, and at least part of a bailout plan includes increasing the number of local shows from 38 to 69 this year. Several unidentified riders told the newspapers Oesterreich and Wiener Zeitung this week they are worried about the welfare of the prized and pampered horses, and that the animals would risk injury if put through too many performances. In the 1980s, some stallions became lame after the number of shows was increased to 70 a year. A pair of origin debate links: [dr filomena] [carniola]. It hasn’t been a good month for animals in Vienna. A shelter where a chimp, who goes by the name Matthew Hiasl Pan, has lived for 25 years, is going bankrupt, which could leave the primate homeless. The Association Against Animal Factories, an animal rights group in Vienna, tried to have him declared a person so they could gain guardianship. But in a ruling yesterday, Austria’s Supreme Court said that a chimpanzee cannot be declared a person. Donors have offered to lend support, the AP reports, but under Austrian law, only a person can receive personal gifts. Next step? The European Court for Human Rights. lj-2007-01-31, originally uploaded by pirano. My dog receives personal (or maybe canine) gifts every day. Good for him I don’t fall under Austrian law.